Will your relocation policy survive a housing crash? Although we heard from the Bank of Canada in late 2017 that a stronger economy and good policymaking are bringing about “a gradual easing” of vulnerabilities in the housing market, many analysts feel that the risks of Canada’s precarious housing market have not gone away. Is your mobility program protected? The financial vulnerability of relocation policies with respect to the changing landscape should to be checked on a regular basis. The cost of GHSP, equity protection, bridge financing, mortgage interest differential, duplicate housing and temporary accommodation can skyrocket if policies are not reviewed and adjusted in a timely manner. 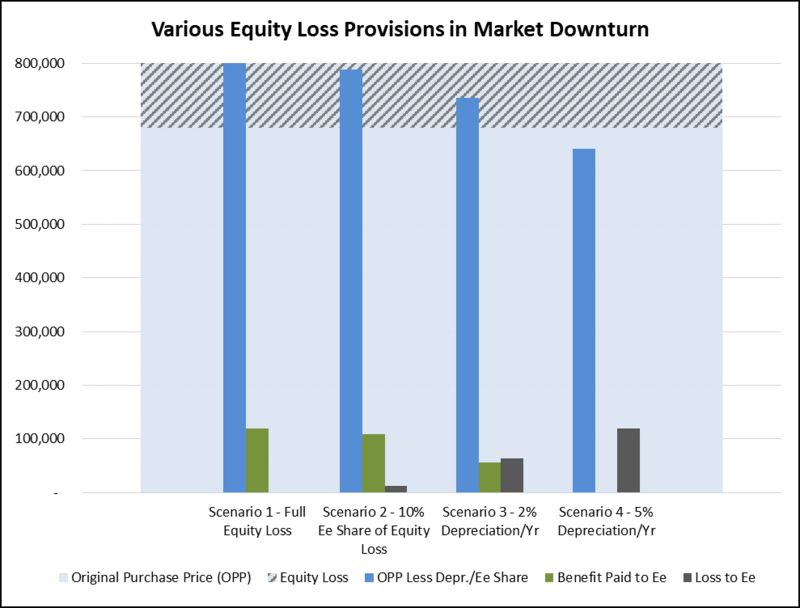 As an example, the following graph presents the effects of a 15% market decline on the equity loss provision in the case of a house originally purchased for $800,000. The four scenarios assume four years of ownership and illustrate how the provision’s design can make a difference in how the program is impacted. An analysis of financial risk can be performed by measuring the degree of sensitivity of various provisions to changes in such factors as salary, income tax differential, as well as housing prices and market fluctuations. Our ValueTrack™ benchmarking system will quickly and accurately assess the financial vulnerability of your policies. Our unique proprietary benchmarking tool quantifies the value of corporate relocation policies and their components using client-specific transfer scenarios. Actionable recommendations are provided to assist in reducing the level of financial risk while maintaining employee satisfaction with the mobility program. In these fast moving and volatile times, risk mitigation is critical to maintaining any form of stability. There is no better time than now to evaluate your policies and obtain the information required to plan for the future health of your relocation program.